These blondies are sooo good. My mother-in-law, Paula could not keep from eating them. 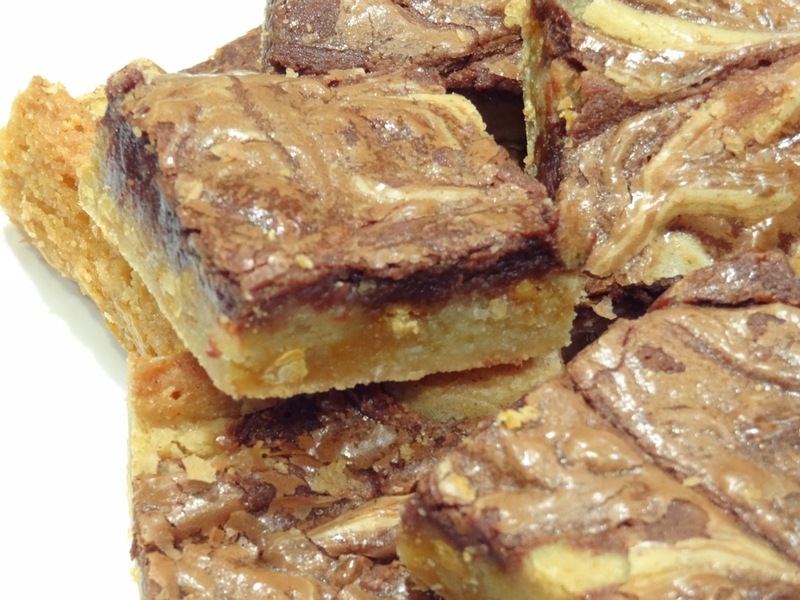 While not a huge chocolate or butterscotch fan (two key ingredients in these Nutella-Swirl Blondies), Paula LOVES these bars! Maybe it’s because she could taste the cream cheese swirled into the Nutella mixture?!?! Haha….she is a sucker when it comes to cream cheese. My mom and sister made blondies last week after having seen them in All You magazine. None of us have ever heard of All You, but that didn’t matter…when we see something that looks delicious, it doesn’t matter where it comes from! If you’re looking for an extremely rich bar with just a touch of chocolate, these are for you. The butterscotch chips and brown sugar crust make for an extremely decadent dessert. You really only need one small bar to satisfy your sweet tooth. For those chocolate lovers, these are not “death by chocolate.” Instead, the Nutella provides a subtle dark chocolate flavor that pairs surprisingly well with the butterscotch. 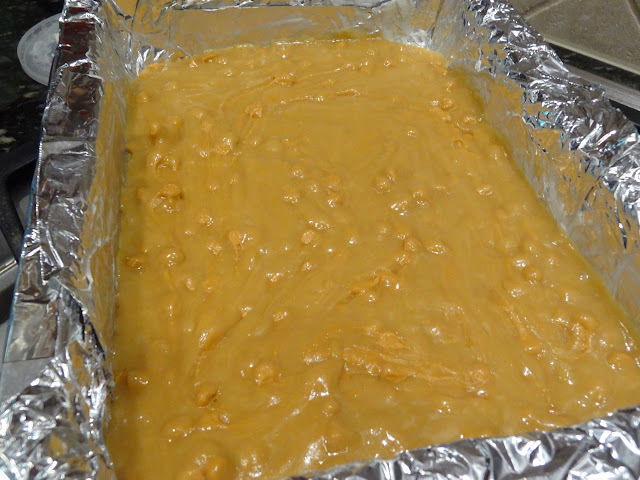 Spread butterscotch mixture into pan. Drop spoonfuls of Nutella over batter. Use the tip of a sharp knife to swirl in Nutella. Bake for 25-30 minutes on a 375 degree F oven. Let cool in pan. 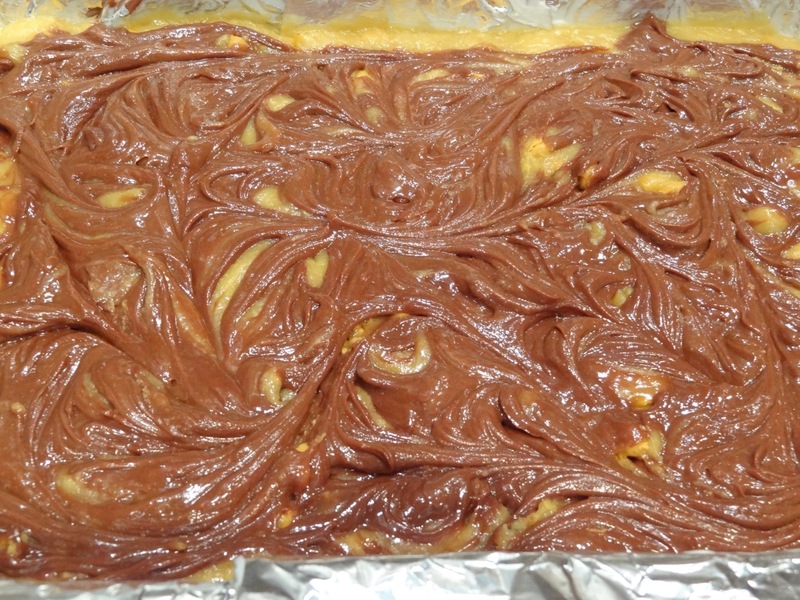 After cooled, cut into squares and serve. 2. Grease 9-by-13-inch baking pan and line with foil, letting ends of foil hang 3 inches over the 2 long edges. Grease foil. 3. Combine sugar, and butter in a large pan over medium heat. Cooking, stirring often, until butter has melted and sugar has dissolved (mixture will not look combined). Remove from heat and let cool slightly. Whisk in 2 whole eggs and vanilla. 4. In a bowl, whisk flour with baking powder and salt. Gradually add flour mixture to sugar mixture; mix until smooth. Fold in butterscotch chips. Spread evenly in pan. 5. Using an electric mixer on medium speed, beat cream cheese with egg yolk and Nutella until smooth. 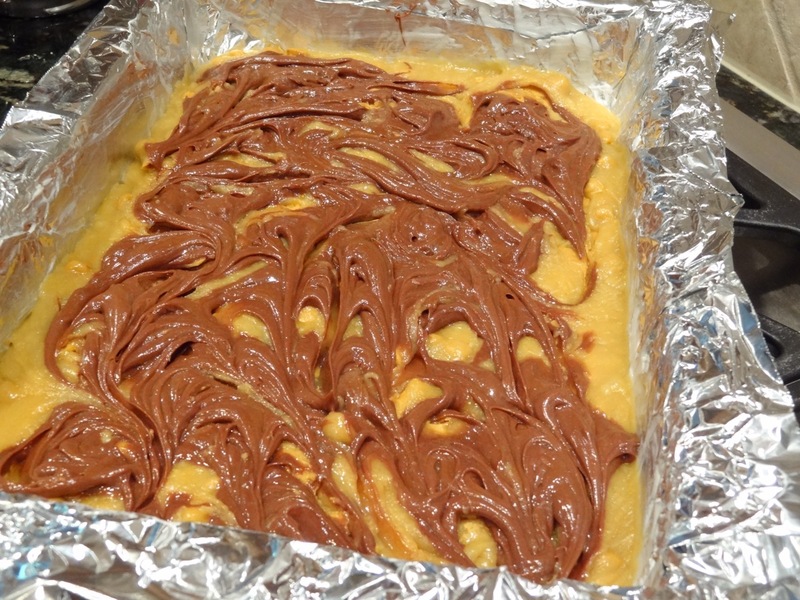 Drop spoonfuls of Nutella mixture over batter in pan and use the tip of a small knife to swirl it in, making a decorative pattern. Do not scrape bottom of pan. 6. 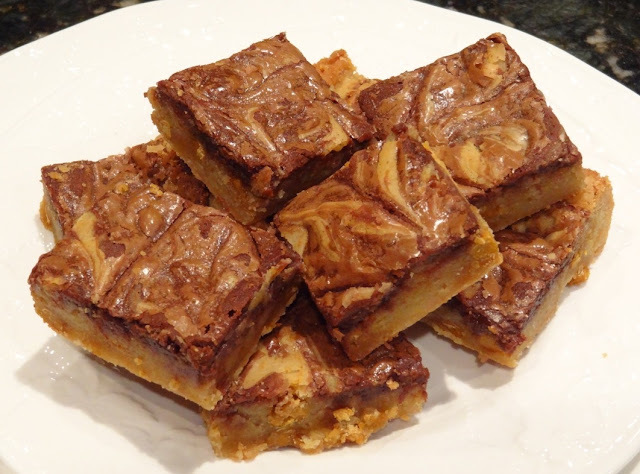 Bake until blondies are just set in the center and a toothpick inserted into center comes out clean, 25 to 30 minutes. Let cool in pan on a wire rack, then cover and refrigerate until thoroughly chilled, at least 2 hours. 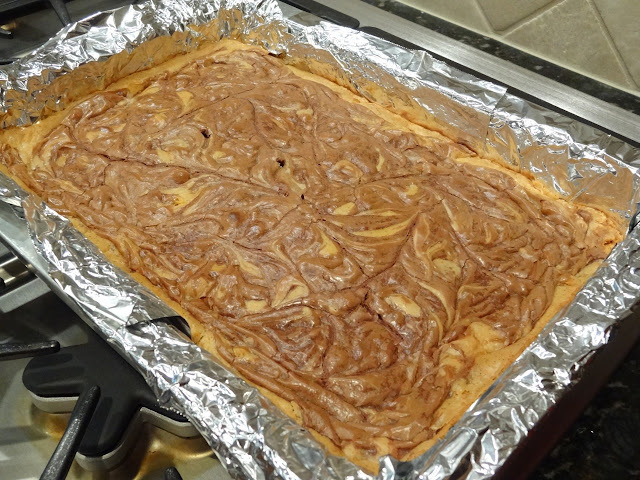 Run a sharp knife along edges of pan to loosen, then remove blondies from pan using foil handles. Cut into squares and serve at room temperature. 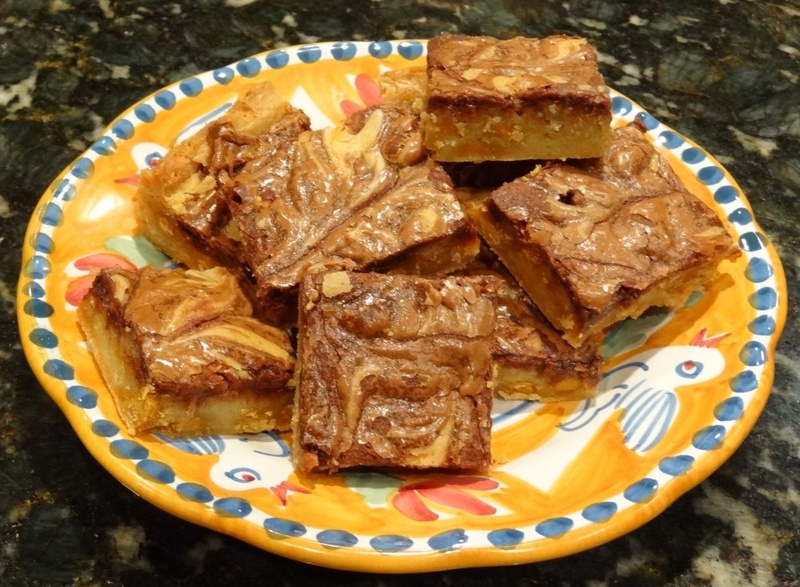 3 Responses to "Nutella-Swirl Blondies"
You should edit that to read “1/2 tsp baking powder”. You mentioned it needed to be added, but it isn’t in the ingredients list. And the salt should read 1/4 tsp. Thanks for pointing this out. I fixed it!